It's about time we set a date for our annual party. Cannot let summer slip by without having it! What? 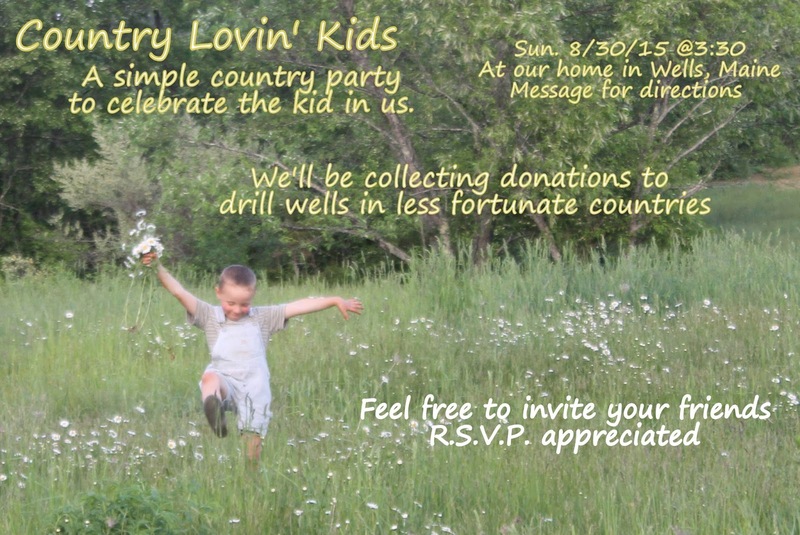 A simple, country kids festival to celebrate the country in our kids. There might be simple games, perhaps a craft, you can pick some wildflowers, take a walk in the field, feed the goats, pet the cows, catch the train going by, help us clear out the secret garden, etc. When? Sunday August 30th at 3:30pm. It's at our place in Wells, Maine. Send a message for directions. Cost? This is our annual party for charity. Last year we helped set up some families in Africa with chickens. Year before we focused on helping foster kids. This year, my little farmers want to "Help people who don't have good water or milk." So, we found that it takes $5000 to drill a well in a less fortunate country. You can buy shares to contribute at $50.00 intervals. We hope to contribute a share or two to help drill a community well. Food? We'll have lemonade, light snacks, as well as a couple desserts. Bring your own drink and sandwich and plan to have a picnic with us. Come anytime 3:30 and after. Stop by for a quick visit or stay for a bit. Come young, come old, and plan to have some fun! It's a family event. You can invite your friends!